Hard to believe that this paint job was a first attempt at the finish by two friends. According to Gary, the second key to success is finding a formula that works and sticking with it. “All the engines I build are basically the same. I could get more power out of them but that stresses components. 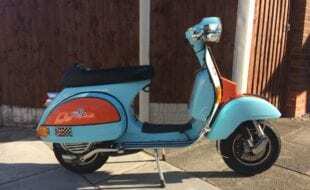 By keeping revs low it reduces wear and increases reliability as they’re built to ride not race.” With slight variations, Gary’s recipe for engine happiness is a TS1 225 kit turning on a SIL crankshaft with a RB rod kit. Fuel is fed via a 34mm Dellorto VHSB carb mounted on a MB manifold and gases are expelled via Saigon Scooter Centre’s version of the old Taffspeed expansion chamber. Once casings are matched to the barrel all the top end components are fitted straight out of the box. Businesslike and beefy rear end. Sparks are provided by a SIL electronic ignition. However, Gary rebuilds the stator, welds the boss and lightens the flywheel. A SIL GP200 gearbox with 19/46 sprockets mated to a four-plate Surflex B clutch fitted with MB springs completes the package. 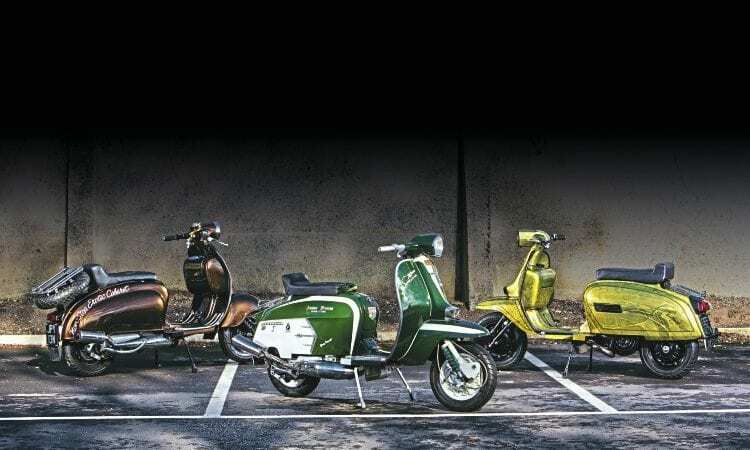 Of course not everyone runs a fleet of scooters but the same principle would apply to club mates. Finally, Gary’s keen on routine maintenance. “I strip the engine down after its first 1000 miles and conduct a visual examination. Piston rings and reed valves are checked every 5000 miles.” Admittedly not everyone’s a competent mechanic but investing in a decent workshop manual, some basic tools and having a go, even if it’s just tackling simple tasks at first, can save a lot of hard earned cash. An often overlooked part of maintenance is keeping things tidy. 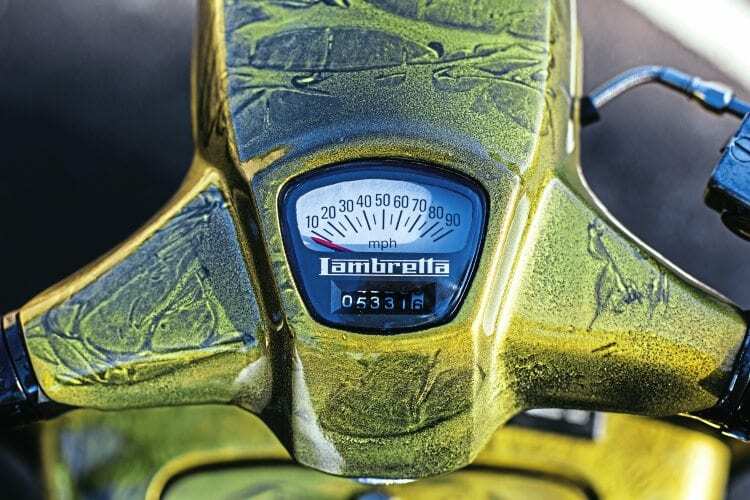 Making sure everything is clean and straight isn’t just about appearances — giving your scooter a regular examination means any problems become obvious before they can cause more serious damage. 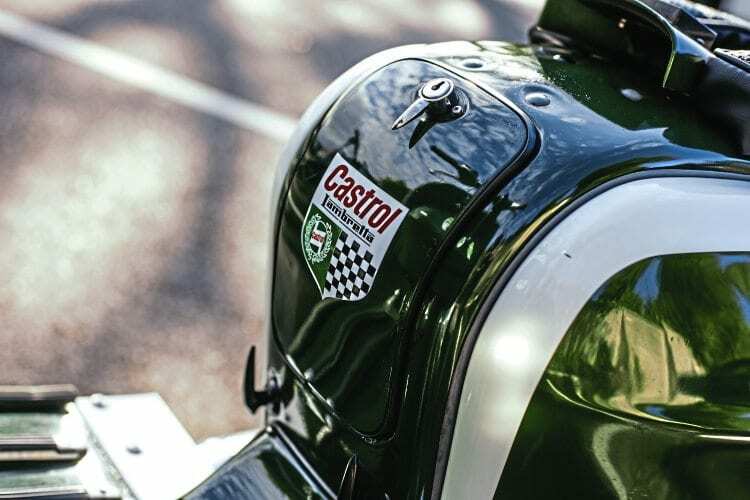 British Racing Green and SX lines. What’s not to like? 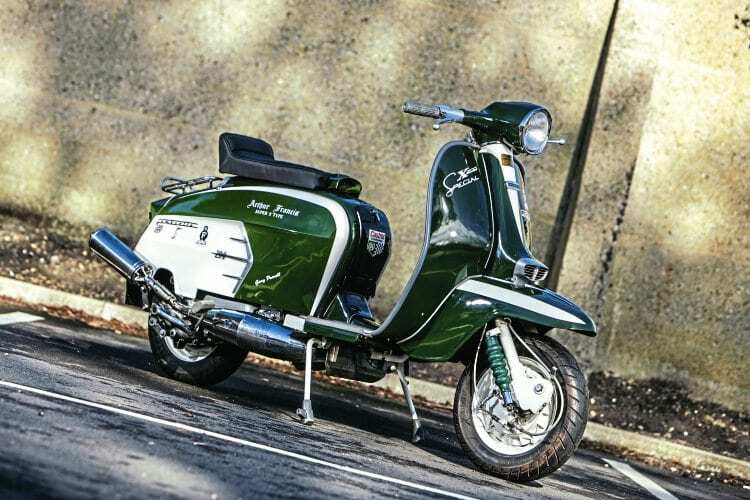 Purists may take issue with Gary’s approach but as classic scooters continue to rise in price few can argue that it makes sense both financially and for sheer riding pleasure. Gary’s not one for keeping receipts but a quick calculation reveals that he’s built all three of these beautiful (and reliable) machines for less than the price of a restored SX200. Job: Senior project manager for an Asset Management Company. Scooter club & town: The exclusive Hartlepool Lambretta Club, Hartlepool. 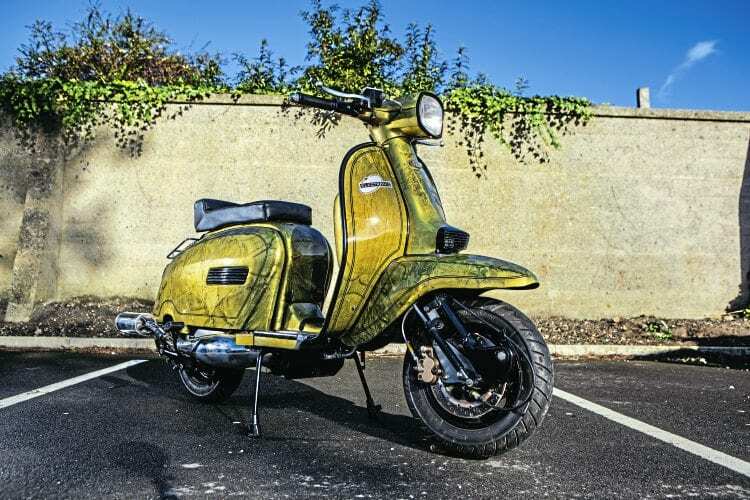 How and when did you first become interested in scooters: I was a Mod at school and always wanted one for as long as I can remember. Lad over the road who was a few years older than me got one and I used to have my nose pressed again the window whenever I heard it. 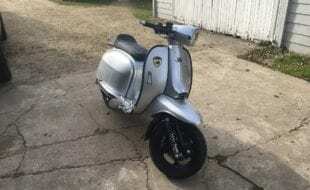 What was your first scooter: Box standard 50 Special at 15 to get it ready for my 16th and be road legal – it was quickly converted to a whopping 110 with a bigger carb and expansion pipe! 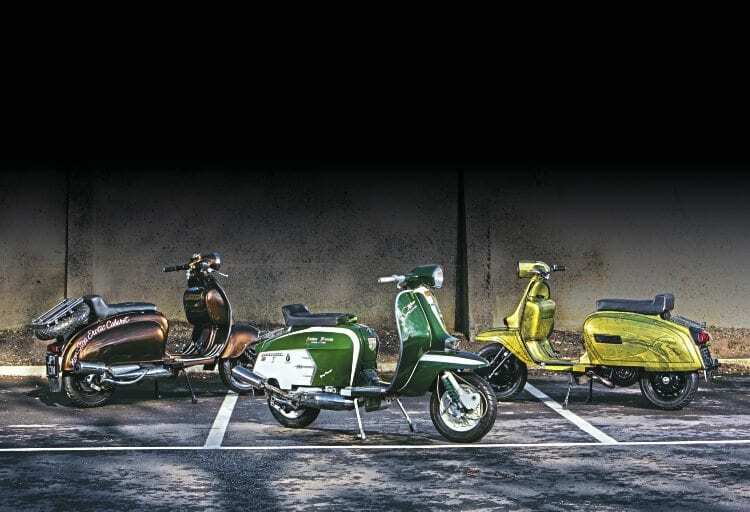 Favourite scooter model: SX or GP but as long as Vespa or Lambretta I like them all – with the exception of the GTS! 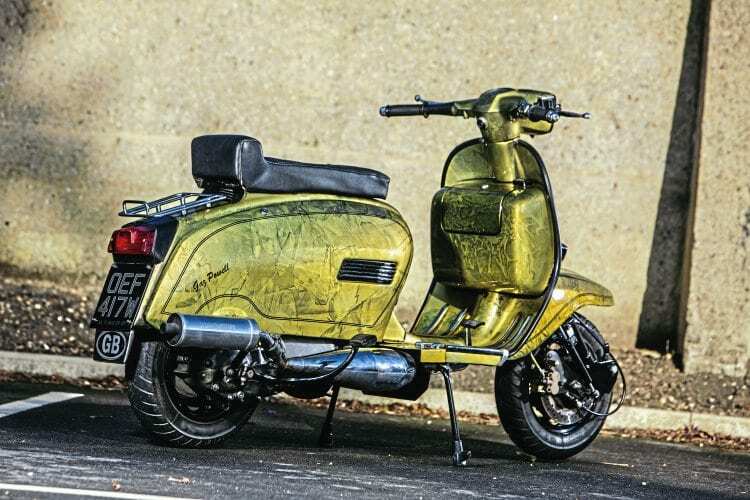 What is your favourite style of custom scooter: I can appreciate anything that’s done well. First rally or event: Redcar Frontline SC. 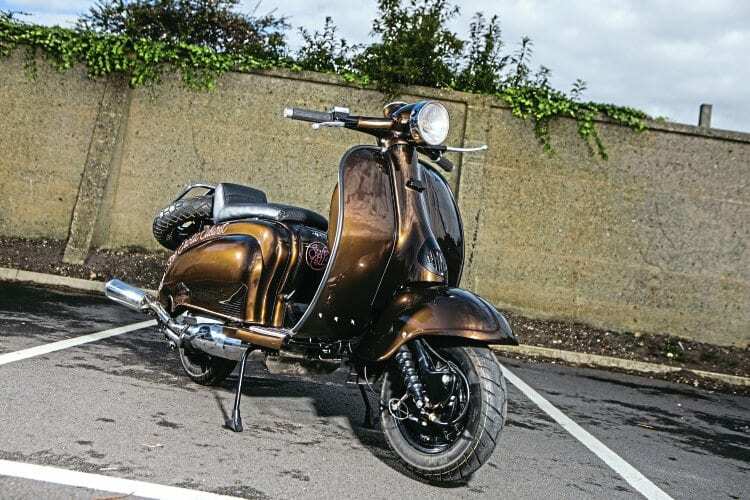 How did you get there: On the 50 Special flanked by a mate on a metal flake AF painted GP. Favourite and worst rally/event: I’m not a lover of holiday park rallies, but I can’t say I have been on a bad rally – I always seem to manage to have a good laugh and a few beers so I can’t ask for much more. 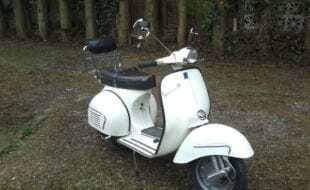 Funniest experience with a scooter: Christ there’s been plenty – not funny at the time but it sticks in my mind – I remember coming home from an LCGB rally at Kettering and I wasn’t feeling very well, must have been a bad pint, anyway got on the M1 and thought right, come on, head down… bike seemed to be struggling in fourth, dropped into third back into fourth, then a coach went past me and everyone was pointing – when I looked back me tent had come out and was acting like a parachute behind me! 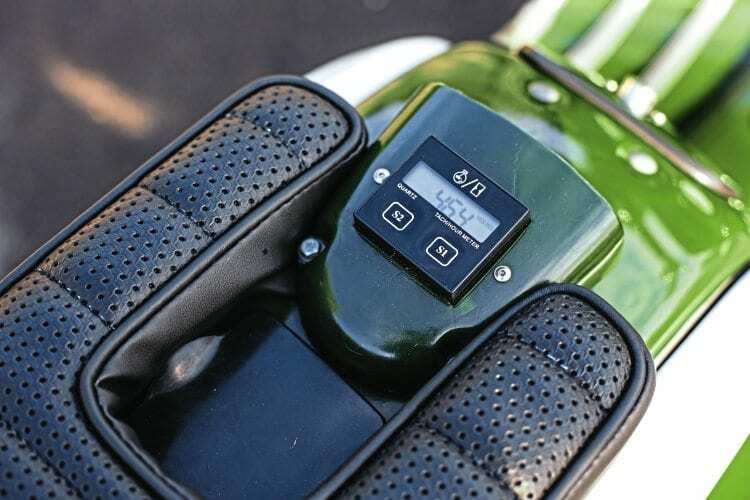 Furthest ridden on a scooter: One of the NSRA Euro Rallies. What do you like about rallies/events: Just meeting up with mates from around the country, having a beer or two and a laugh. I’m still enjoying Nationals because of the mates I have but leaning more and more to LCGB events. What do you dislike about rallies/events: I try not to be negative about it, as rallies/scootering mean different things to different people but it’s probably these people who feel the need to dress up for a rally in what they perceive as the correct attire… I leave it at that. 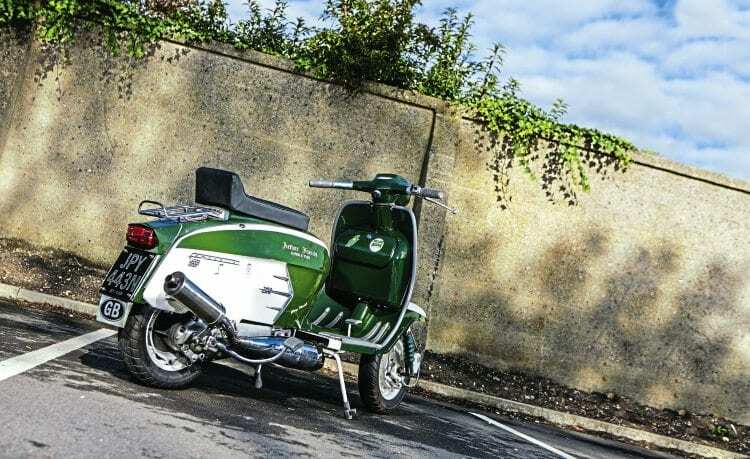 Favourite custom/featured scooter of all time: Difficult one but I think it would have to be a Howlett creation or the Rosa Bianca DTC. 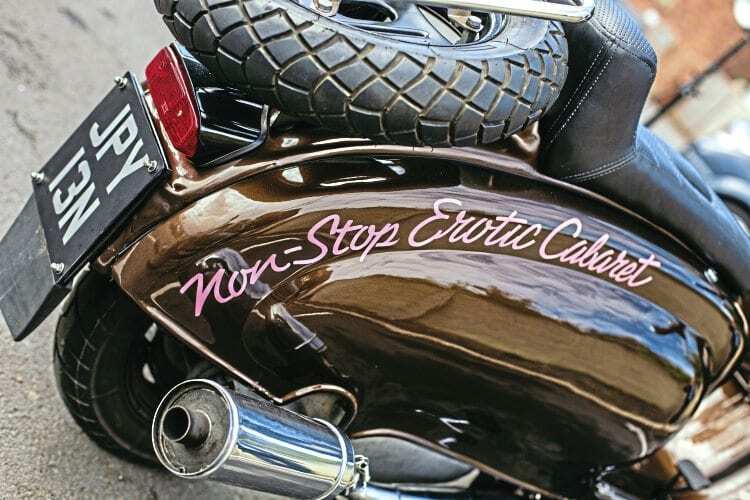 There was a purple Rolling Stones themed bike called Aftermath that I always liked. 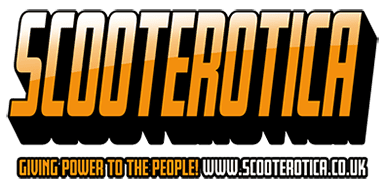 Recommended scooter part or item: If it’s riding gear get a good protective stuff and wear it! 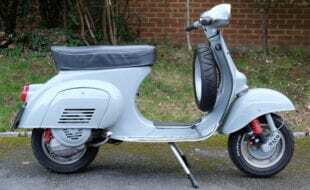 What’s the most useless part you’ve ever bought for one of your scooters: A Leovinci exhaust for a P2 that reduced the top end and virtually wiped out fourth gear at the sight of an incline or the lightest of breeze! 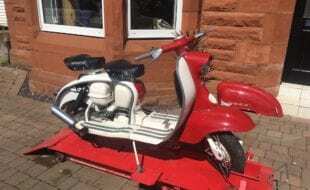 Scooter model: SIL GP – Came from Scooter Restorations as a bare frame, panelwork and a genuine SIL factory engine (£550). 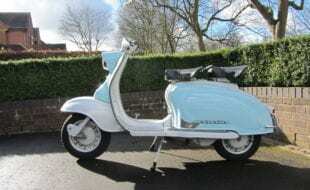 Date purchased & cost: Couple of hundred quid – came from Scooter Restorations as a bare frame, panelwork ad a genuine SIL factory engine (£550). They were cheap back then! Inspiration for project: After building the SX I wanted a tidy GP for hard rally work. Crank: SIL Webs with RB rod kit. Carb: 34mm VHSB on MB manifold and standard reed block. Exhaust: SSC Taffy in stainless steel. 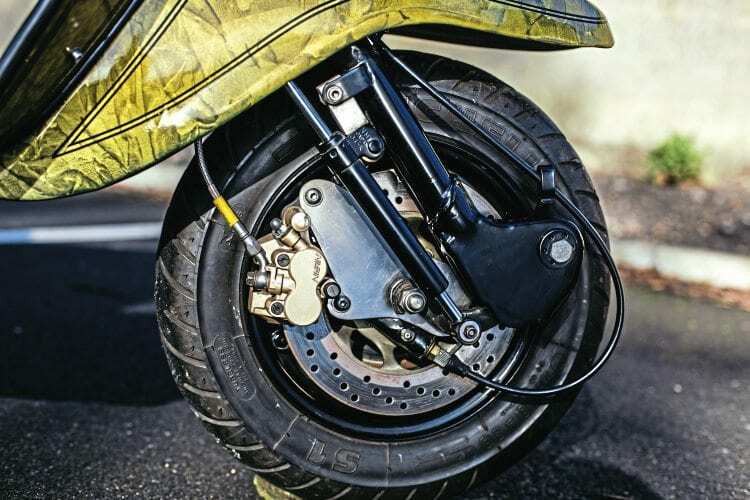 Clutch: Four-plate Surflex B with MB springs. Gearbox: SIL GP200 with 19/46 sprockets. Porting work by: I matched the casings to barrel and that’s it. Built by me. Other: Genuine SIL flywheel and stator – stator rebuilt, flywheel lightened and boss welded (to what is now classed as mid-weight). Twin-tank conversion. Paintwork & murals done by: My mate in town, he did all the painting and I did the cling-film work. I bought the paint which cost somewhere in the order of 100 quid. The pinstriping came later after I’d had time to digest the look and decided it needed something extra. Is there any powder coating: Everything that’s not painted including the frame (loop wet painted) by a local company. Overall cost: About £2500-ish but I never keep a count. Do you have any advice or tech tips for anyone starting a project: Just do it, but dry fit everything and don’t expect new parts to fit or work no matter how so-called top end they are. Is there anyone you wish to thank: DSC Scotty for some help on the way. Only the registration plate gives away the secret of this Series 2. It’s based on the humble API Lamby. Almost identical to its ancestors, Indian Lamby frames can still be obtained at bargain basement prices. This example was purchased two years ago for £200 and now sports fibreglass panels. Date purchased & cost: I bought it as a bare frame a couple of years ago for less than 200 quid. Inspiration for project: Just wanted a tidy S2 and thought let’s go Indian! Time to build & by who: It as built by me from a bare frame. Engine spec: TS1225 sleeved to 66mm and tweaked, with a Yamaha IY175 piston, modified head by Ron Phillips at Fahron Engineering. Crank: SIL Webs RD400 rod. Carb: 30mm PHBH on MB manifold and standard reed block. Porting work by: Casing was a SIL 150 converted by OilTek and I matched the casings to barrel and that’s it. Built by me. Other: Genuine SIL flywheel and stator – stator rebuilt, flywheel lightened and boss welded (to what is now classed as mid-weight). Twin tank conversion. Saving money at the outset means there’s more available later for toys and gadgets. 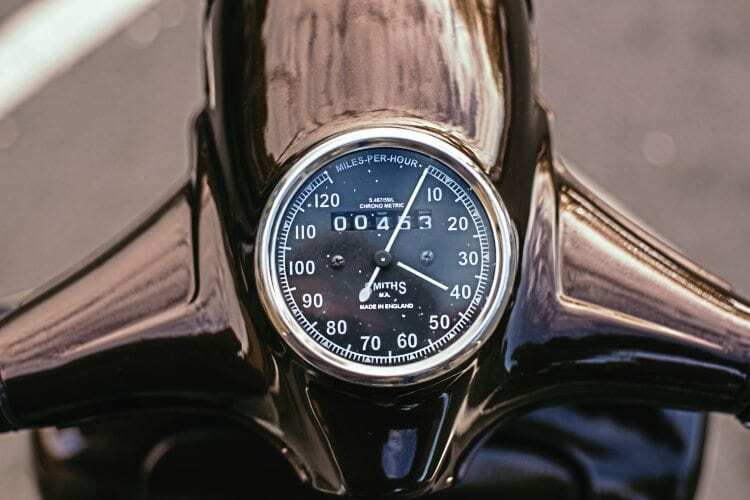 Top speed & cruising speed: TS1 200 with smaller carb so 70 and 60 – it rides incredibly smooth and civilised when in town but can still pull well on the open road. Paintwork & murals done by: A mate in town for £300! 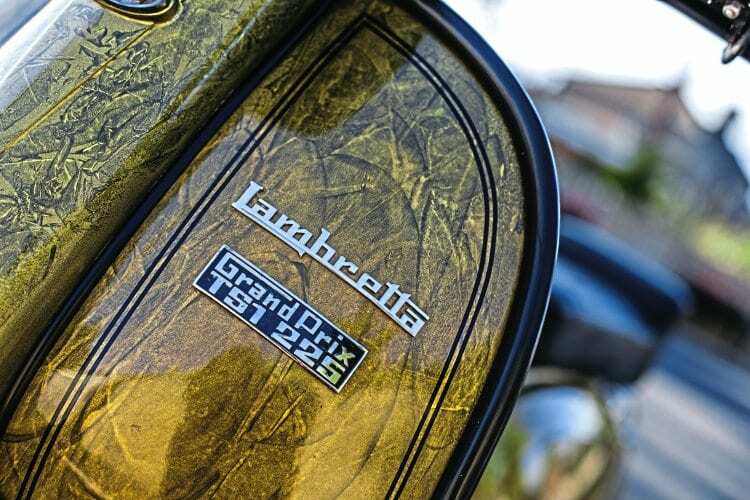 The paint is BMW Marrakesh pearlescent brown. No murals but sign-writing is hand done by an old boy in town who did my 50 Special and first PX back in ‘88/89. He remembered me and was over the moon to be doing some traditional hand work on a scooter. Is there any powder coating: Everything that’s not painted including the frame (loop wet painted) by Elite Coatings in Darlington. Is there anything still to add to the scoot: A mural of Mark and Dave (Soft Cell) in their heyday on the toolbox door. Is there anyone you want to thank: DSC Scotty for some help on the way. The ‘Jet X’ has been Gary’s regular rally going machine since 2001 and has been remarkably trouble free. The only major work required being a repainted side panel after it sprang free. In a display of consistency Gary now needs to make this repair on the Lamby whose side panel fell off on the way home from our photoshoot! Date purchased & cost: Couple of hundred quid as a non-runner and parts missing. 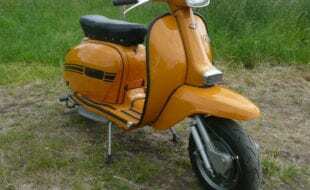 Inspiration for project: After building the Stone Roses custom I wanted a tidy SX for rallying. Time to build & by who: It was built by me – took about a year. It’s been on the road since 2001. Engine spec: Box standard TS1225. Other: Genuine SIL flywheel and stator – stator rebuilt, flywheel lightened and boss welded (to what is now mid-weight). Twin tank conversion. 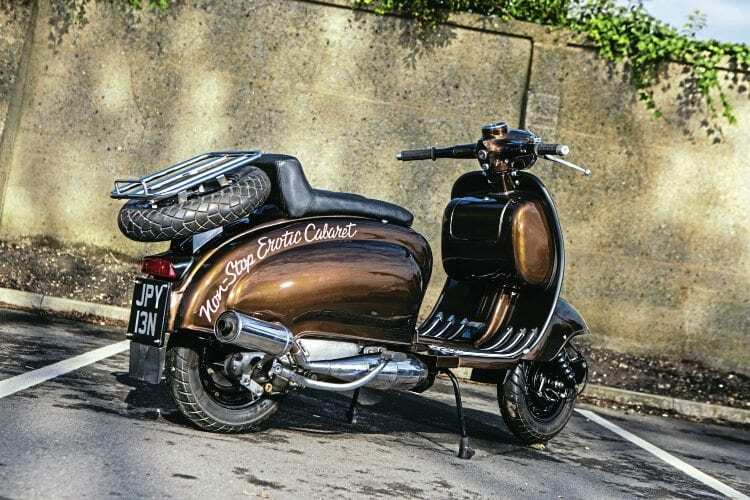 Paintwork & murals done by: My mate in town, few hundred quid – I added all the AF and logos etc. – all stickers! Been on the road since 2001. Had to get one panel redone after it fell off! Disc brake? 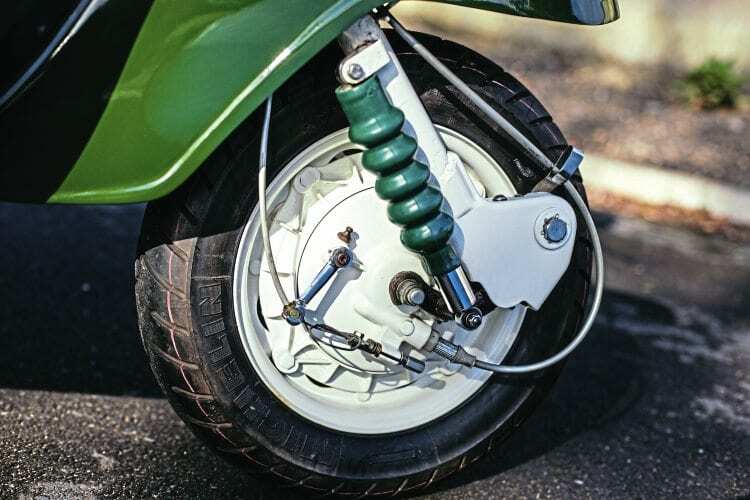 Reverse pull drum has served hundreds of Lambrettas well over the years. Is there any powder coating: Everything that’s not painted. 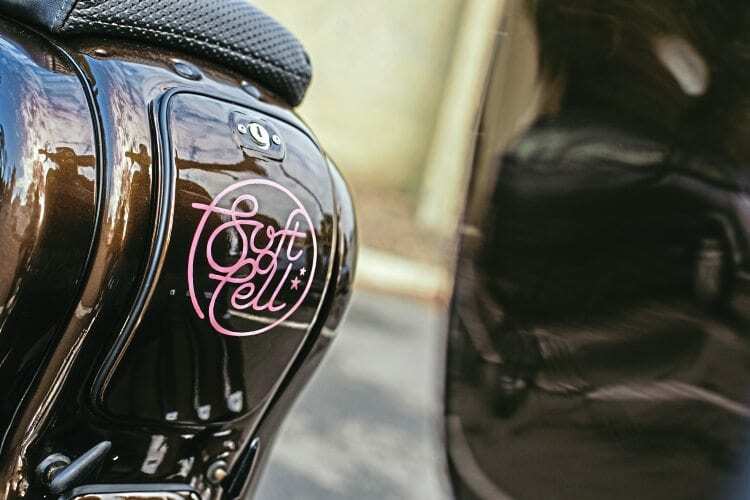 Do you have any advice or tech tips for anyone starting a project: Like I said, dry fit everything and don’t expect new panels to fit – there’s just no guarantee. 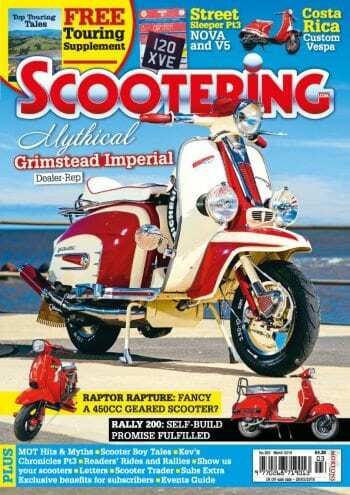 Is there anything still to add to the scoot: Nothing to add – just keep it on the road! In hindsight, is there anything you would have done differently: No, I think it came out well, all things considered. Is there anyone you wish to thank: Not really.